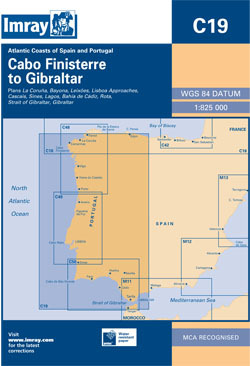 Atlantic coasts of Spain and Portugal from Cabo Finisterre to Gibraltar. Ten-minute gridlines. Scale: 1 : 758.000. Larger scale plans of Viana do Castelo, Bayona, Lisboa Approaches, Figueira da Foz, Bahia de Cadiz, Lagos, Gibraltar, Strait of Gibraltar. Current edition fully updated throughout using the latest known depth surveys. For this 2015 edition changes have been made to depths and navigational aids as required. Harbour developments and general updating has been applied throughout, and the chart now shows details of the amended Strait of Gibraltar TSS.